The new VW Polo 1.0 TSi R-Line Automatic is exactly what buyers of B-Segment vehicles want to buy. Times are changing and buyers are prepared to settle for smaller cars, but they will not downgrade on comfort, safety and features. We would all like to drive something that uses less fuel and engine capacity downsizing is the only way since diesel has been branded the devils’ fuel. Yet we still want good performance and lastly the demand for automatic gearboxes is on the increase. In the past when buying down you had to settle for less and out went the electric this and the automatic that. Safety also wasn’t a huge concern and luxury items such as sunroofs and fog lights were frowned upon. Step into 2017 and consumers having been spoilt for choice are now much more demanding. This brings us to the VW Polo 1.0TSi R-Line Automatic. Available with luxuries usually unheard of in the B-Segment, this Polo is available with automatic LED headlights, automated parking, a full colour reverse camera system and parking sensors not to even mention the sizeable glass roof. These are without any doubt luxury items and not things we exactly need, but should you choose you may have these and so much more. VW even offers in dash satellite navigation and I know we all use our phones, but it’s so much nicer when seamlessly integrated as is the case with the VW system. It may also only feature a 1.0TSi engine with three cylinders, but it produces 81Kw of power and 200Nm of Torque at very low revs which means the automated seven speed DSG gearbox has enough poke to play with so it isn’t hunting for gears like most other small engine automatic vehicles.Then there’s this R-Line body kit which strangely I prefer over the Polo GTi’s. It certainly freshens up the Polo’s overall look, but it also turned several heads in traffic which is interesting since this shape VW Polo has been on the market for quite a while now. It’s an attractive little car, do not get me wrong, but it should not still be turning this many heads. The VW Polo is obviously still quite an aspirational proposition. Then there’s the only negative in my opinion which is the price. It’s not cheap. 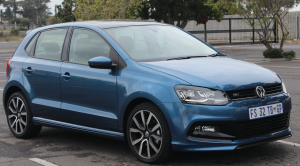 At R292 400 the VW Polo 1.0TSi R-Line is rather pricey and I doubt that the guys an girls who took a second glance will be able to afford this dream of a car.The handling is nice and tidy and the VW Polo has always been a nicely planted and stable little car even at excessive speeds. 0 to 100Km/h takes 10 seconds which isn’t particularly impressive, but it rewards you with a fuel consumption figure of five litres per 100km which is excellent. Interior materials boast high levels of quality fit and finish. The seats are very comfortable and the interior looks and feels premium. I’d go far as saying that Audi needs to up their game a bit because the little VW Polo is getting uncomfortably close to Audi standards of interior harmony. This is not a high performance vehicle so I’ve avoided that part of the conversation. What the VW Polo lacks in performance it anyway more than makes up for in other ways such as low levels of road noise and a sense of premium motoring in the way it cocoons four individuals from the harshness of everyday life. Even sitting in traffic can become a pleasant experience thanks to the intuitive infotainment system which coincidentally packs a substantial punch. Safety is also well catered for with several active as well as passive safety features including electronic stability control, four airbags and emergency brake assist to name but a few. This latest VW Polo model is such a comprehensive product offering that I’m sure VW Golf 7 buyers now have an excellent opportunity to downgrade in size but keep every other VW Golf 7 benefit besides that pricy rear suspension. I didn’t think VW would be able to improve on the Polo but they have and it wasn’t for the new VW Polo being launched in about six months I’d even tell you to go buy one of these. This very last version of the 2017 VW Polo is a run-out model and won’t be considered new in a few months, but keep in mind that it is the ultimate in this generation of Polo. The best combination of engine, gearbox, fuel consumption, features and stringent quality control measures come together in this VW Polo 1.0TSi with R-Line cosmetic package and it will not leave you wanting for anything more. 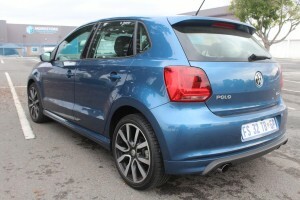 Should you buy this you won’t be buying VW Polo, you will be buying B-Segment perfection and that’s the truth.